In Oman, global leaders in water treatment processes and desalination plants relied on Protec Arisawa to manufacture the pressure vessels for their most important project: the Barka Independent Water Project (IWP) plant. This 281,000-m3/d capacity seawater Reverse Osmosis facility is the largest desalination plant in the country. 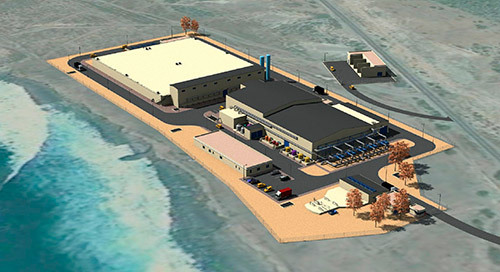 Finally, the Barka Desalination Company announced the opening of the Barka Independent Water Project (IWP) plant in July 2018, an essential infrastructure for the development of energy and water production for the main water network of Oman. At Protec Arisawa, we consider this major event as a new success of our state-of-the-art pressure vessel solutions. However, Protec was not alone in this project: the Barka Independent Water Project was completed in less than 30 months by a consortium consisting of Itochu Corporation, ENGIE, SUEZ and Towell Engineering, under a 20-year Water Purchase Agreement (WPA). Thanks to the association of these main actors in water industry, the new seawater treatment complex has a capacity of 281,000 cubic meters per day: the largest desalination plant in the country. As accorded, SUEZ will operate and maintain the plant for twenty years. Who are Protec’s partners in IWP? SUEZ is a multinational company headquartered in Paris (France), dedicated to the operation and procurement of water, electricity and gas services in several countries around the world. Today, this group employs more than 160,000 people. With a presence on all five continents, the French company is a key player in the sustainable management of resources. SUEZ generated total revenues of €15.3B in 2016. 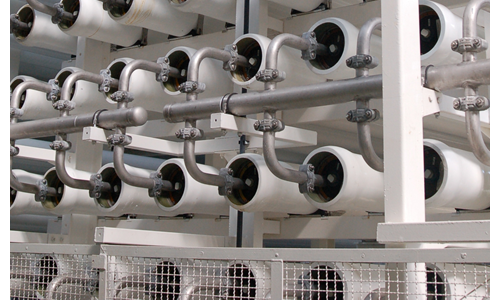 In this case, SUEZ was responsible for the design, construction, ownership, financing, operation and maintenance of this brand new seawater reverse osmosis desalination plant, located at a coastal site near Barka (in the Al Batinah region), on the Gulf coast of Oman, 50 km west of Muscat. Thanks to the 3,181 Protec FRP pressure vessels, the whole complex will be able to desalinate up to 281,000 cubic meters per day applying the newest reverse osmosis techniques. Since July, the Barka plant is providing an environmentally-friendly and sustained supply of high-quality drinking water with minimum electrical energy consumption, thus offering more energy efficiency than the current state-of-the-art desalination systems. As global leader in FRP pressure vessels for reverse osmosis water purification treatments, Protec is extremely pleased to collaborate with the major players in the sector. But this is only the beginning… Oman Power and Water Procurement Company (OPWP) initiated the pre-qualification process for developers to set-up two new independent water projects (IWPs) in the same Al Batinah region. The two future water desalination plants will have a combined capacity to produce 250,000 cubic meters of water per day, and will be located at North Al Batinah and Barka, confirming this Red Sea area as a promising market for desalination processes, due to the growing number of membrane desalination plants in the region. Therefore, our objective must be to expand Protec’s field of action in the Omani market, supported by the quality of the best fiber-reinforced pressure vessel solutions for water purification. 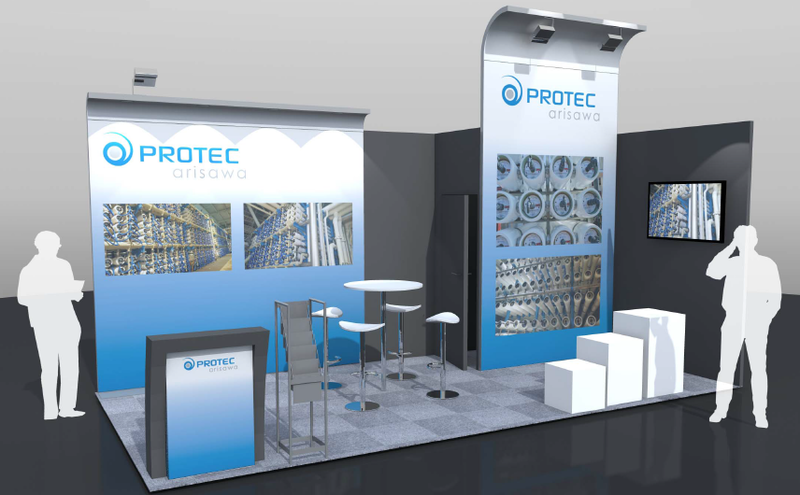 At Protec we live and work every day to take part in the most ambitious projects, both from an industrial and technological viewpoint. Over 40 years of experience confirm our global leadership in the development and production of FRP vessels. This major hit in Oman is the best proof that Protec Arisawa has further reinforced its leadership position as a main supplier for the desalination industry, racks and Reverse Osmosis processes. Veolia Water Technologies has just inaugurated Campo Dalías, one of the biggest desalination plant in Europe. So as to built the plant, it has been required a total of 12,810 membranes and the construction of 41 km of distribution pipelines. Protec Arisawa has taken part in the project suppling 1.398 pressure vessels of 8” diameter and 1200psi design pressure and 425 pressure vessels of 8” diameter and 1000psi design pressure. Protec Arisawa will produce the pressure vessels for Agadir desalination plant. Abengoa affiliated company, Abengoa Water, has relayed on Protec Arisawa for the production and provision of the pressure vessels for the plant which, once finished, will become the biggest desalination plant in Moroco. The plant will use the most modern ultra filtration pre-treatment systems and reverse osmosis technology to desalinate sea water. The plant will supply 100,000 m3/day of drinking water to more than 800,000 people in the region. It will also ensure the drinking water supply and water security in the zone, further contributing to the development of the tourism and agricultural industries that are the main economic drivers of this region. Protect Arisawa will supply a sum of 928 pressure vessels designed and produced following the ASME Code. Depending on the model each vessel will be three or four side ported designed and produced out of superduplex stainless steel so as to avoid corrosion. Protec Arisawa has produced and supplied pressure vessels for the biggest desalination plants that Abegona Water has developed lately around the world. Protec Arisawa will partipate in the 25th edition of Aquatech. The exhibition will take place in Amsterdam from the 3rd to the 6th of November 2015. 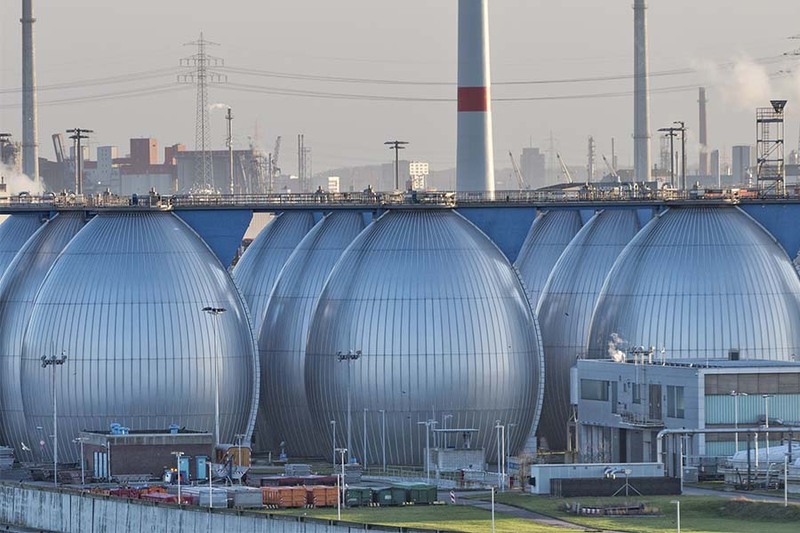 More than 19,000 international water technology professionals will convene in RAI Amsterdam during 4 days filled with inspiration and innovation. We invite our clients, suppliers and friends to visit Protec Arisawa team at stand 01.101. Aquatech is the world’s leading trade exhibition for process, drinking and waste water. Offering a complete product overview in the field of process, drinking and waste water, market leaders (in the world) will be present. Protect Arisawa continues developing its strategy of applying innovation to every production and management process. This time the company has focused on the pressure vessel appearance. The products are designed and fabricated following the usual technological process but from now on customers will easily recognize them because they will have Protect Arisawa logo on them. Protec Arisawa is the global leader for the design and the manufacturing of Fiber Reinforced Plastic Pressure Vessels for membrane filtration systems. With three production sites located on three different continents and over 40 years of experience in filament winding, Protec Arisawa is your supplier of choice when it comes to selecting high-quality pressure vessels with leading technology. Protec Arisawa will participate in IDA World Congress 2015 with a big stand and a numerous delegation made up of both Europe and American teams. Senior Directors and Sales Managers from Protec Arisawa America and Protec Arisawa Europe will be in San Diego from august 30th to September 4th to assits clients, suppliers and friends who want to come over and visit us. 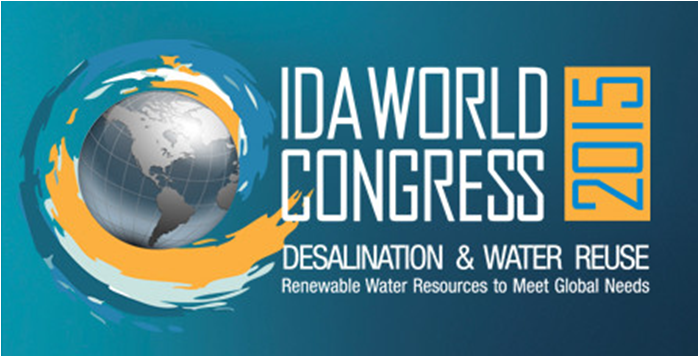 IDA, World Congress is the premier global event in the desalination and water reuse industry. The Congress offers exceptional opportunities to expand knowledge of current and emerging desalination and water reuse technologies. 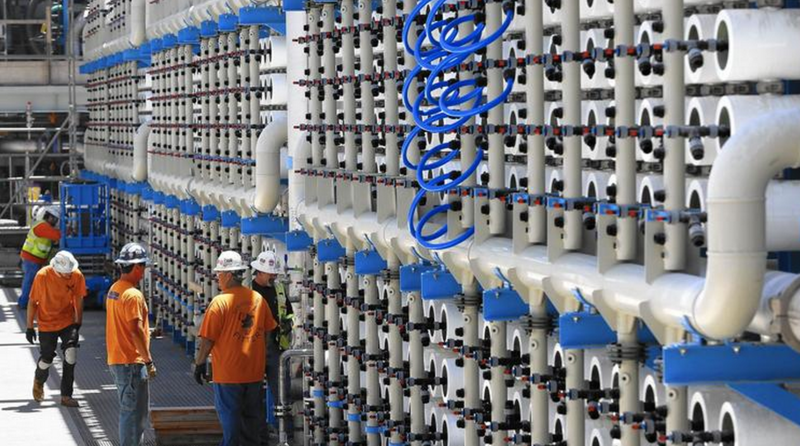 The L.A Times has just published an article about Carlsbad desalination project. The plant, located in California, is being built out of Protec Arisawa Pressure Vessels. According to the American newspaper “this is the largest desalination plant in the western hemisphere and will generate 50 million gallons of potable water a day. The plant will serve about 300,000 people, which is about seven percent of San Diego County’s water supply”. The Carlsbad plant is expected to begin operation by Thanksgiving 2015. A sum of 2200 Protec Arisawa Pressure Vessels with size 8” diameter and design pressure of 1,200 psig are being used in the project. Protec Arisawa Pressure vessels are fabricated & tested in accordance with the engineering standards of the Boiler and Pressure Vessels Code of the American Society of Mechanical Engineers (ASME) section X. For Carlsbad project Protec Arisawa decided to manufacture the pressure vessels in the factory located in California. The plant, inaugurated by Abengoa in Ghana, is already able to supply 60.000 cubic meters to the cities of Teshie, Tema y Nungua whose population is experiencing strong growth. The project included the development of the infrastructures necessary for the capture of sea water, the application of pre-treatment system by ultrafiltration, reverse osmosis desalination, currently the newest technology and the use of efficient solutions for energy recovery among others. Almost 588 pressure vessels fabricated & tested by Protec Arisawa, in accordance with the engineering standards of the Boiler and Pressure Vessels Code of the American Society of Mechanical Engineers (ASME) section X, have been used in the project. These pressure vessels were manufactured according to project specifications: design pressure 1000psig and size 8”. 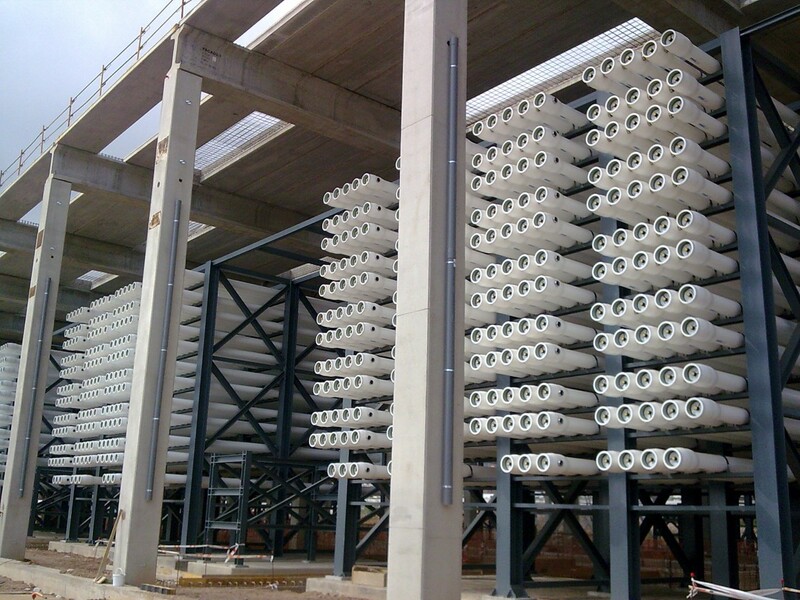 The desalination plant has a wide acceptance among the Ghanaian authorities and the local population because it will improve the quality of life for the inhabitants of the region. 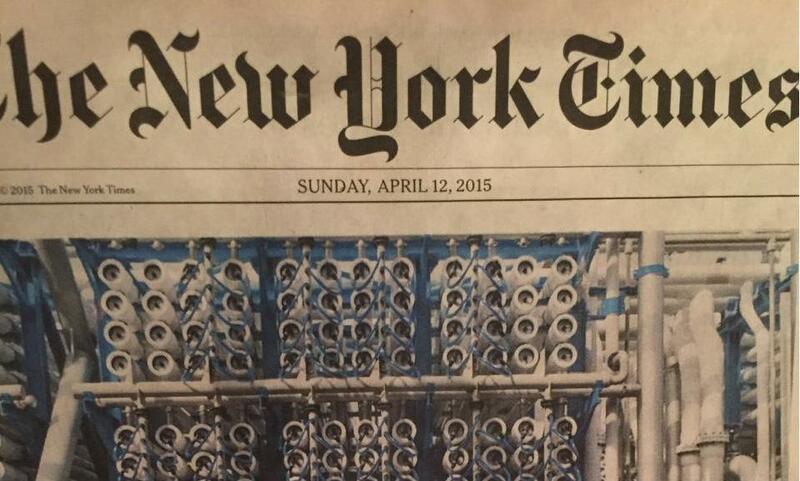 The prestigious news paper dedicates part of its cover to stand out the proliferation of desalination plants in USA. The New York Times explains in a detailed article how a technology “once dismissed as too expensive and harmful to the environment” is becoming indispensable for more and more countries around the world. Metropolis investing billions of dollars in the industry, small ocean desalination plants up and running in a handful of towns, estates studying the issue, benefits facing up to inconvenients. Protec Arisawa plays a leading role in this industrial revolution designing and manufacturing high quality Fiber Reinforced Plastic Pressure Vessels for membrane filtration systems. Protec Arisawa will provide Degremont with the Membrane Housings in the Mirfa project which will combine existing and new facilities to offer a power capacity of 1,600 MW and a seawater desalination capacity of 52.5 MIGD (238,665 m3/day). The total investment cost of the project is approximately $1.5bn, funded by a mix of debt and equity. Degremont will handle the reverse osmosis facility. The Suez Environment subsidiary was last month awarded the contract by Masdar to build an energy-efficient pilot desalination plant, powered by renewable energy. Degremont will be responsible for the design, engineering, procurement, construction, operation, maintenance and evaluation of the pilot plant, over the course of 18 months.